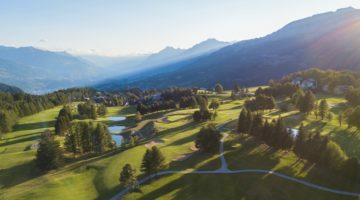 The 9-hole Jack Nicklaus course is situated on a 5,000-foot high plateau in Crans-Montana, complete with stunning views of the Mont Blanc and Matterhorn. 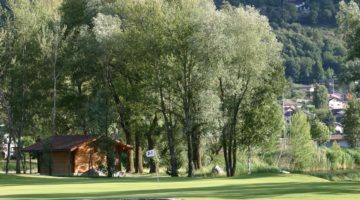 Little surprise that the Crans-sur-Sierre course has been awarded the title of the most beautiful 9-hole course in Switzerland no less than four times. The rather short course requires high precision and a good strategic approach. The many gentle doglegs and obstacles call for a skilful approach by newcomers and experts alike. 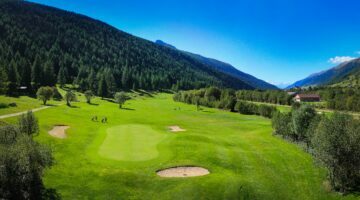 If you want to play on a compact course of the highest quality and enjoy breathtaking views at the same time, come and test the facilities at the Jack Nicklaus Crans-Montana. Driving range, specialized bio mechanics – analysis with certified Coaches, Indoor golf. Members of ASG clubs or members of international recognized golf clubs. Course Permission required.